Some elementary school counselors use books and other media to facilitate the counseling process. A school counselor is a counselor and educator who works in schools. They are often referred to as guidance counselors or educational counselors. In professional literature, the term school counselor is preferred. Most school counselor occupations or equivalent occupations (such as career counselor) are comparable to the high school counselor in terms of duties and services. Historically, the need for high school counselors has been emphasized more so than school counselors in lower grades. Countries vary as to whether school counseling services are provided. The purpose of guidance counseling is to help students achieve happiness and success within their social and educational context. For young children this involves adaptation to the educational environment, and addressing any social or family problems that may interfere with the child's psychological health. For older students choice of career based on interest and ability takes precedence, although serious problems such as alcohol or drug abuse, sexual abuse or domestic violence situations, bullying and other situations that lead to severe stress are also addressed. The successful school counselor is one who takes the role of a loving parent, concerned and empathetic, able to listen and win the trust of students, and with the time and self-confidence to make a difference in their lives. In the United States, the school counseling profession began as a vocational guidance movement at the beginning of the twentieth century. Jesse B. Davis is considered the first to provide a systematic school guidance program. In 1907, he became the principal of a high school and encouraged the school English teachers to use compositions and lessons to relate career interests, develop character, and avoid behavioral problems. Many others during this time did the same. For example, in 1908, Frank Parsons, "Father of Vocational Guidance," established the Bureau of Vocational Guidance to assist young people in making the transition from school to work. From the 1920s to the 1930s, school counseling and guidance grew because of the rise of progressive education in schools. This movement emphasized personal, social, and moral development. Many schools reacted to this movement as anti-educational, saying that schools should teach only the fundamentals of education. This, combined with the economic hardship of the Great Depression, led to a decline in school counseling and guidance. In the 1940s, the U.S. used psychologists and counselors to select, recruit, and train military personnel. This propelled the counseling movement in schools by providing ways to test students and meet their needs. Schools accepted these military tests openly. Also, Carl Rogers' emphasis on helping relationships during this time influenced the profession of school counseling. In the 1950s the government established the Guidance and Personnel Services Section in the Division of State and Local School Systems. In 1957, the Soviet Union launched Sputnik I. Out of concern that the Russians were beating the U.S. in the space race, which had military implications, and that there were not enough scientists and mathematicians, the American government passed the National Defense Education Act, which spurred a huge growth in vocational guidance through large amounts of funding. Since the 1960s, the profession of school counseling has continued to grow as new legislation and new professional developments were established to refine and further the profession and improve education. On January 1, 2006, congress officially declared February 6-10 as National School Counseling Week. Professional school counselors implement a comprehensive school counseling program that promotes and enhances student achievement through a guidance curriculum, individual planning strategies, responsive services, and comprehensive school counseling program support and advocacy. A fully implemented district-wide comprehensive school counseling program should meet the needs of 100 percent of the students—just as the district's mathematics program is for 100 percent of the students. Professional school counselors, in most states, have earned a Master's degree in guidance and counseling with an emphasis in school counseling. They are employed in elementary, middle/junior high and high schools and in district supervisory, counselor education, and post-secondary settings. Their work is varied, with attention focused on developmental stages of student growth, including the needs, tasks, and student interests related to those stages. Professional school counselors meet the needs of student in three basic domains: academic development, career development, and personal/social development. Knowledge, understanding, and skill in these domains are developed through classroom instruction, appraisal, consultation, counseling, coordination, and collaboration. For example, in appraisal, school counselors may use a variety of personality and vocational assessment methods to help students explore vocation needs and interests. Classroom guidance lessons are designed to be preventive in nature and include self-management and self-monitoring skills. The responsive services component of the school counselor's role provides individual and/or small group counseling for students. 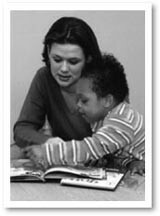 For example, if a student's behavior is interfering with his or her achievement, the counselor will observe that student in a class, provide consultation to teachers and other personnel to develop (with the student) a plan to address the behavioral issue(s), and then work together to implement the plan. They also help by providing consultation services to family members. Additionally, school counselors may lead classroom guidance on a variety of topics within the three domains such as personal/social issues relative to student needs, or establish groups to address common issues among students, such as divorce or death. Often counselors will coordinate outside groups that wish to help with student needs such as academics, or coordinate a state program that teaches about child abuse or drugs, through on-stage drama. Elementary school counselors adapt counseling to meet the developmental needs of young children. To facilitate the counseling process, they use a variety of media such as crayons, paint, puppets, clay, children's books, and toys. It is typical for elementary professional school counselors also spend 35 to 40 percent of their time in classroom guidance. Though not ideal, they are sometimes on a rotating schedule with "special area" teachers such as music education teachers, art education teachers, or physical education teachers. In middle school counseling, the school counselor typically is less engaged in classroom instruction than in individual planning for high school and beyond. Individual and small group responsive services continue. Middle school counselors must address the social/emotional issues that arise among this age group, especially peer pressure, bullying, depression, and academic challenges. Also, the counselor usually spends time on vocational exploration and assessment with seventh and eighth grade students as they prepare for high school. In high school, the school counselor continues to provide responsive services and provides fewer classroom guidance strategies. The high school counselor provides large group guidance units and lessons on post-secondary options. For example, the high school counselor helps students prepare for post-secondary education and/or training options (such as college, trade school) by engaging students in finding accurate and meaningful information on entrance requirements, financial aid, recommendation letters, test-preparation and so forth. School counselors at the high school level spend much of their time helping students monitor their progress toward graduation and being adequately prepared for post-secondary options. While some high school counselors spend time developing the school's class schedule, this is considered a non-guidance task and takes valuable time away from direct work with students. Some students now turn to private guidance counselors specialized in college admissions, although the fees for these services can be very high. The professional school counselor is a certified/licensed educator trained in school counseling with unique qualifications and skills to address all students’ academic, personal/social and career development needs. According to the Council for Accreditation of Counseling and Related Educational Programs (CACREP), a school counseling program should meet several standards such as the professional identity of school counseling (history, organizations, and so on), cultural diversity courses, human development and growth, and career development. Additionally, it has to have core components for helping relationships (consultation, counseling, so on), group work, assessment, research and program evaluation, knowledge and requirements for school counselors, contextual dimensions of school counseling, and foundations of school counseling. In programs that are CACREP accredited, a school counseling student must have 600 hours of internship under a highly qualified school counselor (master's degree or higher, and appropriate licenses and certifications). School counselors may opt for national (American) certification through two different boards. The National Board for Professional Teaching Standards (NBPTS) requires a two-to-three year process of performance based assessment, and demonstrate (in writing) content knowledge in human growth/development, diverse populations, school counseling programs, theories, data, and change and collaboration. Financial incentives are offered for this certification in several states. The National Board for Certified Counselors (NBCC) requires passing the National Certified School Counselor Examination (NCSC), which includes multiple choice questions and simulated cases which assess school counselors' abilities to make critical decisions on the spot. Additionally, a master's degree and three years of supervised experience are required. NBPTS also requires three years of experience, however a master's degree is not required, but only state certification (41 of 50 require a master's degree). At least four states offer financial incentives for the NCSC certification. A close second is empathy. "The ability to experience as one's own the feelings of others" is key, reports one school-counseling consultant. Ability to build close and trusting relationships with students and members of the school community. Belief that counselors make a difference. A California school counselor commented: "Commitment to the belief that counseling makes a difference in student lives and futures must be a foundational belief held sacred by that counselor—Without that commitment to the process of change, a school counselor will not be able to effectively serve as a catalyst in student lives and a significant change agent in the educational community." Flexibility is key. "A rigid person just couldn't survive very well in this type of setting!" added a Missouri counselor. "You must be able to switch gears and think fast." Self-knowledge. This is a crucial competency that includes a deep understanding of one's paradigms, biases, strengths, and weaknesses, and theoretical perspective on counseling. It can make the difference between a mediocre career and one that has lasting impact. In addition, another counselor states that "you cannot be an effective counselor if you are not physically, mentally, emotionally, and spiritually healthy." the child's "house has many mansions"—including a spiritual life that grows, changes, responds constantly to the other lives, that in their sum, make up the individual we call by a name and know by a story that is all his, all hers. School counseling programs and the students they serve would benefit from adopting a more holistic or socio-cultural perspective of human development—one that extends to the spiritual. This might include students' attempts at making sense of their lives, discover purpose- or meaning-seeking activities, thoughts, feelings, and so on, which are self-energizing. Counselors can support students to draw on their spiritual strengths to solve tough problems, and access alternative and preferred stories of identity and ways of behaving. In developmental terms, another way to conceptualize these overt or covert expressions of spirituality is to call them "scaffolding schemas." Lev Vygotsky noted that structure is important in the child's learning in order to foster their emerging capabilities. Further developed in the context of cognitive development and education by Jerome Bruner, these scaffolding schemas can be built together by the student and an adult (parent, teacher, counselor) working together to build upon what has already been experienced and matured to enable further growth and development. Aspects of these schemas include both helpful and harmful preexisting orientations or patterns that assist the students in the process of navigating and interpreting life's experiences and obstacles. The schemas generally reflect one or more of the three major aspects of children's spirituality: awareness, self-knowledge, and personal transcendence. Educating the whole child was recommended by many philosophers and educators in the past, including Martin Buber and Johann Heinrich Pestalozzi, and is a philosophy of the Waldorf schools worldwide. In fact, state-funded schools in the United Kingdom are intentional about this, including spirituality in a generic sense as part of core curricula as part of the Education Reform Act of 1988. ↑ 1.0 1.1 1.2 J. J. Schmidt, Counseling in Schools: Essential Services and Comprehensive Programs (Boston, MA: Allyn & Bacon, 2003, ISBN 978-0205340569). ↑ Jeffrey Gangemi, "How to buy your way into college" Business Week, (October 3, 2006). Retrieved March 13, 2008. ↑ Council for Accreditation of Counseling and Related Educational Programs: The 2001 Standards Retrieved March 13, 2008. ↑ Board Certification, The National Board for Professional Teaching Standards. Retrieved March 13, 2008. ↑ Kimberly Mcleod, March/April 2005, The Case for Certification: A Personal Perspective. ASCA School Counselor, Alexandria, VA: American School Counseling Association. ↑ Gary Hopkins, 2005, School Counselors Reflective On What Makes Them Effective, Education World. Retrieved March 13, 2008. ↑ Christopher A. Sink, 2004, Spirituality and comprehensive school counseling programs, Professional School Counseling, June, 2004. Retrieved March 13, 2008. ↑ 8.0 8.1 Robert Coles, The spiritual life of children (Boston: Houghton Mifflin, 1990, ISBN 0005993105). ↑ Education Reform Act of 1988 Retrieved March 13, 2008. All links retrieved July 18, 2017. This page was last modified on 18 July 2017, at 15:09.